everything we sell we privately own. Our exclusive inventory of carefully selected parcels is owned by us free and clear. 3.) Sell the asset at a profit. our clients from the start to finish of the investment process. a. Land Banking is the practice of buying land in the path of growth. 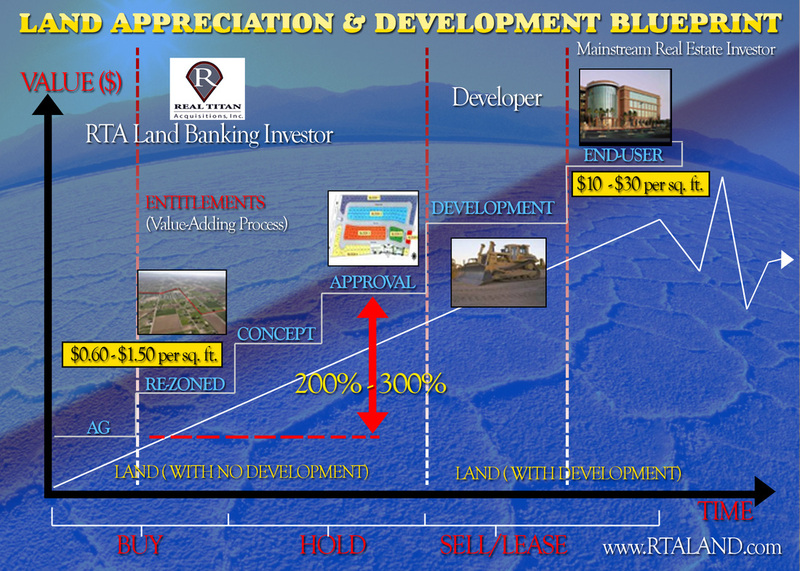 The land parcel must meet each of the 10 Key Growth Indicators. The 10 key indicators are the pivotal difference between a speculative land purchase and a replicable successful land investment. is unearned because the beneficiary has done nothing; other than buy land and wait to be rewarded. maximum profitability, it is imperative to handle and manage these communications actively and proficiently. Real Titan Acquisitions, Inc.
exceptional advantage over other asset classes resulting in consistent sustainable value for true wealth creation. exit strategy for our investors.